Florences’ region continues to advance its position as the nation’s most dynamic producer of premium wines. Tuscany’s modern renaissance in wine began in Chianti, in the central hills around Siena and Florence, but it rapidly spread to take in the strip along the Mediterranean coast that was not previously noted for vineyards. Notable progress has been made with classcial reds based on the native Sangiovese vine – Chianti, Brunello di Montalcino, Vino Nobile di Montepulciano and Carmignano – all DOCGs. But growing success with other reds (especially the prestigious non-DOC wines know as “Super Tuscans”) has been augmented by new styles of whites to enhance the region’s reputation. Chianti, still the dominant force in Tuscan viniculture, has long rated as the most Italian of wines. Chianti is produced in eight distinct district zones and adjacent areas that cover a vast territory of central Tuscan around the original core of Chianti Classico, whose producer’s consortiums are symbolized by a black rooster. Many estates also emphasize the name of a special vineyard as a mark of distinction. What Chianti has in common with all of the traditional red wines of Tuscany is its major grape varietal: Sangiovese. Tuscany’s appellation of greatest stature is Brunello di Montalcino, a DOCG from a fortress twon south of Siena where reds of legendary power and longevity have commanded lofty prices. Brunello producers also make the DOCs of Rossos di Montalcino, a younger wine also from Sangiovese clone. The production of upscale alternative wines, which began as a trend in the 1970s, became an essential factor in the general improvement of Tuscan reds. Cult wines that have become know as “Super Tuscans” continue to prosper. The Sangiovese-Cabearnet blend of Tignanello served as the model for Tusany’s new style of red wine aged in small oak barels or barriques instead of ancient casks. Then came Cabernet-Sangiovese blends and, later, reds from Merlto, Syrah and Pinot Nero. Super Tuscans rank among the most esteemed and expensive red wines of Italy. 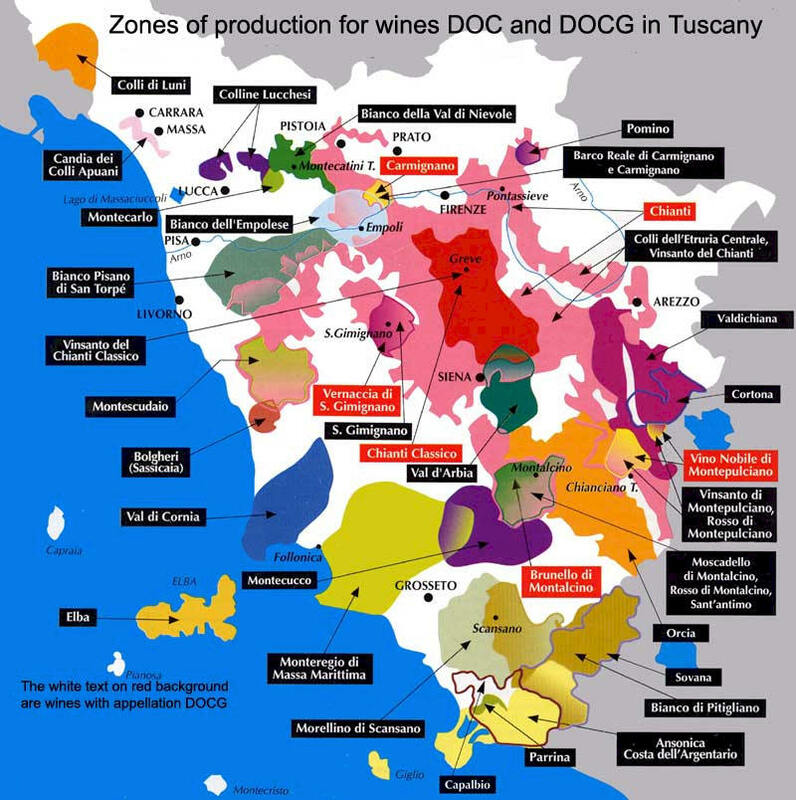 Thogh not classified as DOC/DOCG, most are entitled to the regionwinde Toscana IGT. The pride of many a Tuscan winemaker is the rich Vin Santo, which has become DOC in many zones around the region. Pressed from partly dried grapes and aged in small wooden barrels, Vin Santo can be an exquisite dessert or aperitif wine. Most Vin Santo is made from white varieties, mainly Malvasia and Trebbiano, though the type called Occhio di Pernice comes from red wine grapes.